With South Texas ranch, Caesar Kleberg became a pioneer of Texas wildlife management. Caesar Kleberg, a genial bachelor in a battered wide-brimmed hat and high lace-up boots, began working behind the scenes a century ago to protect wildlife and habitat, and he has been credited with launching the restoration of white-tailed deer, turkey and bobwhite quail in Texas. Kleberg was acknowledged as “the father of wildlife conservation in Texas” by the Texas Legislature in 2009. Conservation and wildlife management was an unexpected career path for the young man, born in Cuero in 1873. He left St. Edward’s University before graduating to assist his father, U.S. Rep. Rudolph Kleberg, in Washington, D.C. That practical education in politics gave Caesar Kleberg insights that proved invaluable when he returned to Texas in 1900 to work on the King Ranch as an assistant to his uncle, Robert J. Kleberg Sr., who had married Alice King. The couple’s five children treated Caesar Kleberg as a beloved older brother who had a room in their rambling house where widow Henrietta King reigned. Family loyalty was paramount. In 1904, Caesar Kleberg became an incorporator of the St. Louis, Brownsville and Mexico Railway, which sliced through the King Ranch. A railroad hotel built for potential land buyers at the ranch’s Norias Division, 50 miles south of headquarters, soon became a mecca for hunters of deer and game. The train also stopped to let passengers shoot geese and deer. A hunter equally interested in watching wildlife, Kleberg observed that deer, wild turkey and bobwhite on the Norias were on the verge of disappearing. He decided that the best way to preserve the ranch’s wildlife was to reduce hunting. In 1912, he set four strict rules for hunters: No shooting game at water holes; deer season ends when the rut begins; turkey can be taken only with a rifle shot to the head or neck; and no firing at quail when the covey first rises. 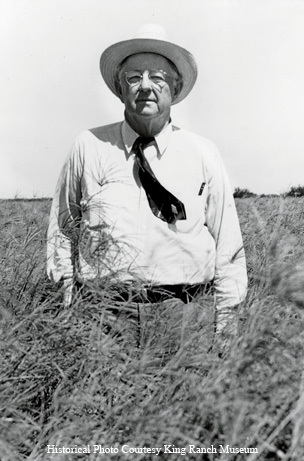 His uncle Richard soon applied Kleberg’s game management plan throughout the King Ranch’s million-plus acres. Kleberg developed his wildlife conservation rules 20 years before Aldo Leopold wrote Game Management, the pivotal book on restoring and managing wildlife. Ranch guests and employees alike had to abide by the stringent hunting regulations, which were enforced by patrols and posted on the ranch’s boundaries. Without hunting pressure, game on the King Ranch rebounded, while outside it dwindled further. Kleberg introduced habitat restoration as a second facet of wildlife management. Wells on all parts of the ranch were adapted to keep water available to wildlife at all times. Brush shelters for quail provided close cover. In 1916, he noted that rainfall was the biggest determinant of quail populations. Mule-powered stump pulling and eradication of encroaching brush began as early as 1910. He started a predator control program targeting coyotes and bobcats, and by 1925 the ranch employed a full-time trapper. The combined efforts brought success. In 1925, the state designated 414,313 acres of the King Ranch as a Texas state game preserve with state wardens patrolling it. By 1928, deer and turkey were abundant enough to be shipped off to stock depleted areas. Caesar Kleberg found a platform to circulate his ideas statewide when he was appointed to the Texas Game, Fish and Oyster Commission in 1917, serving on that predecessor of the Texas Parks and Wildlife Department for 20 years. In cahoots with his aunt Alice Kleberg, he persuaded Gov. Pat Neff to decree a 10-year statewide ban on hunting wild turkeys before they went the way of the buffalo. He championed and mentored game wardens, and his numerous political connections boosted his impact. “I am anxious to comply with any suggestion made to me by Mr. Kleberg,” wrote William J. Tucker, executive secretary of Texas Game, Fish and Oyster Commission. Slow-speaking and unfailingly courteous, Caesar Kleberg was a yarn teller able to hold his own with visitors. According to Duane Leach, a trustee of the Caesar Kleberg Wildlife Research Institute who is writing a biography of Kleberg, these visitors included Will and Roy Rogers, Sam Rayburn, ranchers, tycoons and Hollywood stars. As second in command for operations of the entire ranch, Kleberg brought the first nilgai, a large antelope, to Texas. He helped foster the ranch’s crossbreeding program that developed the Santa Gertrudis, a breed of cattle suited to the hot, humid environment. He bought the colt that became known as Old Sorrel, whose progeny included the first registered American quarter horse. Kleberg’s friend Max Hirsch, a noted horse trainer, guided the family into thoroughbred racing, which culminated in 1946 when Assault won racing’s Triple Crown. Caesar Kleberg had died a few weeks earlier at 73. Tom Lea, who wrote The King Ranch in 1957, said, “No man who ever rode the King Ranch pasture numbered as many friends of as many kinds as ‘Mister Caesar.’ He lived as a bachelor at the ranch for 46 years devoting to it his astute judgment, his keen wit and his genial heart.” Caesar Kleberg and the King Ranch remain great examples of private conservation efforts using science to conserve and improve game and nongame wildlife. In his will, Kleberg set aside $10,000 for the preservation of wildlife in Kenedy and Kleberg counties. In 1981, the Caesar Kleberg Wildlife Research Institute opened in Kingsville at the Texas A&I campus he helped establish. Acknowledging private landowners’ contributions to conserving wildlife, the institute conducts habitat ecology and wildlife biology research across South Texas for game and nongame wildlife.